Originally posted 5/09/15 — Updated 4/16/16 with new photo. So I was playing something or another on Steam last night while sitting in my office watching the children, who were in an entirely different room but that’s besides the point. 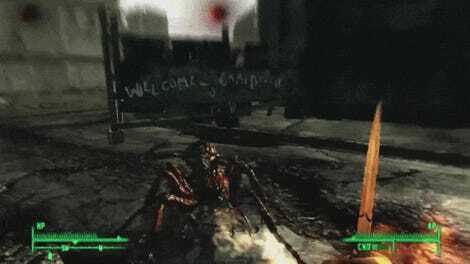 As I was playing—I believe it was that new cyberpunk game Dex—I leaned back in my chair and happened to spot a spider the size of a small Volkswagen on the ceiling directly over my head. Artist interpretation of ceiling spider. Now one would think that a 6’6” man would not be afraid of tiny little arachnid, but I am a 6’6” man with a vivid imagination and strange thought processes. In my mind, the smaller an evil little thing is, the more of them can fit on my oversized body. It may only take a couple hundred spiders to cover an average sized man. I could easily host a thousand spiders. That’s my S.H.C.—spider hosting capacity. With most of my body frozen in fear, my right hand took it upon itself to act. As lefty gripped the armrest in terror, righty proved its dominance once again, searching over my desk for something capable of disabling the forward scout of a potential arachnid army from a safe range (say, New Jersey). An empty Monster Energy can? Too light, too little spider-slaying surface. Lemon Pledge? No, that would just cause it to fall into my mouth, and the only thing worse than a spider in your mouth is a citrus spider in your mouth. Finally my right hand grasped hope. Pushing back from the desk slowly, I shook the can of spray adhesive vigorously, removed the cap, aimed and fired. Within milliseconds the large black spider was a large frosted black spider, the sort you might find in your cereal box if you had the sort of nightmares I do. It took a few small steps across the ceiling and then froze in place. My weapon was effective, or was it? What if the spider was faking, waiting for me to resume my game before adhering itself to my face? And was an adhesive-coated spider hanging over my head any better than a regular one, really? I had to finish the job. I reached for the first firm, flat thing I could find, and I squished. 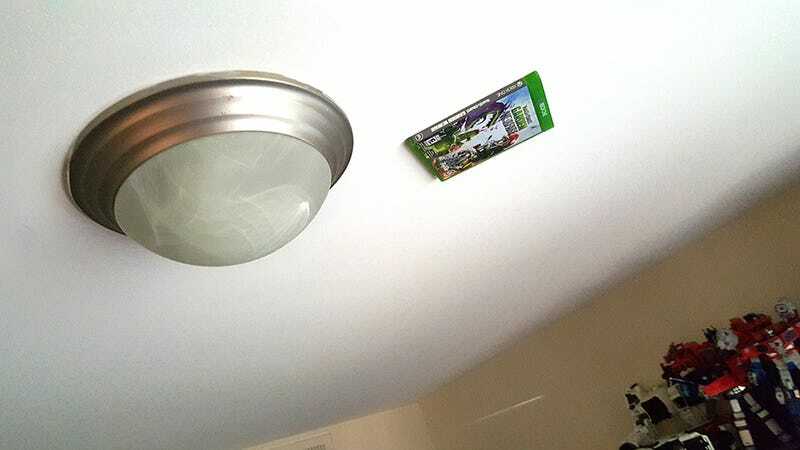 And that’s why Plants Vs. Zombies: Garden Warfare for the Xbox One is firmly stuck to my office ceiling. It’s been there since yesterday, and shows no signs of coming down any time soon. Maybe I’ll run with it. Each time I finish a game I could spray the back with glue and stick it up there, a ceiling-mounted shrine to all the games I’ve played before. Then again, the more games on the ceiling, the more places for the spiders to hide. I’ll probably just stick with the one. Update 4/16/16 — It’s almost been a year since Plants Vs. Zombies: Garden Warfare saved my life, and to this day it stands silent vigil atop my head. If you need to stick a game case to your ceiling, Elmer’s Craft Bond is the way to go.